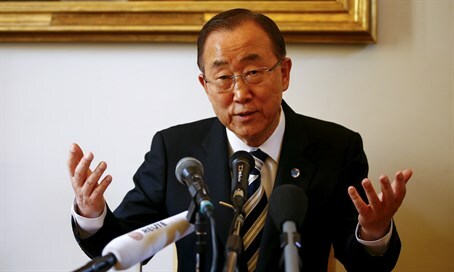 UN Secretary-General Ban Ki-moon has invited Egypt, Jordan and Saudi Arabia to a meeting this month of the Middle East Quartet seeking a diplomatic solution to the Israeli-Palestinian conflict. The foreign ministers of the three Arab countries will join their counterparts from Russia, the United States and EU foreign policy chief Federica Mogherini for the talks on September 30, the UN spokesman said Friday, according to AFP. The secretary general of the Arab League will also attend the meeting on the sidelines of the UN General Assembly gathering of world leaders. The invitation follows a decision by the Quartet in February to include Arab countries in the diplomatic effort to restart the peace process between Israel and the Palestinians. Speaking in Luxembourg earlier, Mogherini said the European Union had "revitalized the work of the Quartet" and voiced hope that this could help "re-open prospective and political horizons to the talks." French Foreign Minister Laurent Fabius has said that expanding the Quartet to Arab countries would be a way to revisit a peace plan put forward by Arab states. The 2002 Arab Peace Initiative calls for an Israeli withdrawal from the "Palestinian territories" - Judea and Samaria (Shomron) - in exchange for full normalization of ties between Israel and the Arab world. However, the 2005 Disengagement from Gaza, an arguably similar move, has not led to peace at all - and has intensified terror activity from the region as well as increased hostility toward Israel from the Arab world at large.